Last night in Detroit, Jim Thome came up with two men on in the top of the 7th inning and smacked a 2-1 pitch from Tigers reliever Daniel Schlereth over the left field wall for a three-run homer. It was his second home run of the game, and it not only basically put the game away for Minnesota (the Twins went from up 6-5 to up 9-5), but it might have had an astronomical impact on Jim Thome’s Legacy. The home run was Thome’s 11th this season, and the 600th of his career. It also brings up an interesting question. If you’re a one dimensional player, can you still get into the Hall of Fame if you’re among the elite at that one particular thing? As always, I like to make sure all of my readers know who I am talking about, so here’s a little bit about Mr. Thome’s illustrious career. The Peoria, Illinois native was drafted by the Indians in the 13th round, way back in the 1989 amateur draft. Originally more of a slap hitter, Thome spent parts of 1991 and 1992 as a bench player for the Indians. Soon after, he changed his swing and became an elite power hitting prospect, mashing 20 home runs for the big league club in about half a season 1994. He never really looked back from then on, hitting 25 big flys in 1995 and never dipping below 30 homers (including years of 47 and 52 dingers) until 2002. After his 52 home run 2002 season, Thome hit the free agency market. Eventually, the Philadelphia Phillies signed the then 32 year old to a six year, $85 million deal. Thome kept mashing homers for the Fightin’ Phils, smacking 47 in 2003 and 42 in 2004, before injuries derailed his 2005 season (.207 with 7HR). The Phillies decided to not risk a possible injury related decline from Thome, and traded the slugger to his home town (close enough) Chicago White Sox that off-season for Aaron Rowand, Gio Gonzalez and another minor leaguer. The injury decline never really happened, as Thome hit 111 home runs over the next three seasons for the White Sox. During the 2009 playoff push, Thome was traded to the Dodgers, where he barely played. Many thought his career was coming to an end, but Thome signed to be the part-time designated hitter for the Minnesota Twins in 2010. 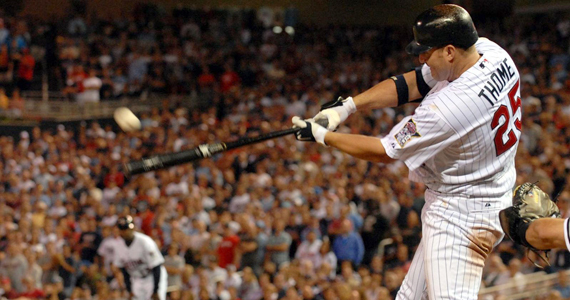 Life as a part-timer rejuvenated Thome, and he mashed 25 homers in just 276 ABs that season. He re-upped with the Twinkies for 2011, again as a part time DH, and that’s where he hit his magical home run last night. The only real argument here is that Thome is a one dimensional player who has spent the better part of the last six seasons as a designated hitter. In fact, the only reason he hasn’t been a DH for the last ten full seasons is because he was playing in the National League for three seasons before that. Thome no longer plays on the defensive side of the ball, and he wasn’t that great at it when he did. Also, the 600 home runs represent the only real milestone Thome will reach in his career. His 2265 hits are impressive, but more indicative of a lengthy career than a real hitting prowess, and he has no chance at the 3,000 hit plateau. His career batting average is a pedestrian .277, and he has only hit over .300 three times in his career (not since 2002). In all, all Thome was really truly elite at was hitting home runs. Is that really worthy of a HOF induction? Yes, Jim Thome has mostly been a one dimensional player for his entire career. Nowadays especially, he can really only hurt you in one way, and that’s with the long ball. So what? The man has 600 career home runs. Do you know how many people have 600 career home runs? Including Thome, there are eight people who have hit 600 jacks for their careers. Eight out of what, hundreds of thousands? That’s twenty less people than are in the 3,000 hit club and twelve less than those who have thrown perfect games. Listen to these names: Micky Mantle, Jimmie Foxx, Reggie Jackson, Mark McGwire and Frank Robinson. Guess what? None of those guys hit 600 home runs (see what I did there?)! The names that do have 600? Bonds*, Aaron, Ruth, Mays, Griffey, A-Rod, Sosa and now… Jim Thome. Everyone else on this list should probably be in the Hall of Fame (yes, even with all the steroids and corked bats). Unlike a couple of these men, Jim Thome has never been linked in any way to steroids, even though he played most of his career during the infamous “steroids era.” He’s either really good at cheating, or he never used steroids. Any time you can do something that only eight people have ever done (and only four who haven’t been linked to mountains of performance enhancing drugs), it is hard to argue that you shouldn’t be in the Hall of Fame. In five years, when Thome is elligible for the Hall, he’s definitely getting my vote, and other people who will actually have a say should vote for him too. I most certainly will say he’s going to be in the HOF. Here is a guy who has hit 600 career hr’s and you have not heard a peep from this man and he did not cheat, or used corked bats, doing through what has been deemed the steroids era, he goes in day in and day out and works hard. I tip my cap off to him. I most certainly would vote him in for the HOF if I have a vote that is…I will settle on getting a Thome jersey at some point for sure! why the asterisk on bonds? i thought steroids, but then shouldn’t sammy have one too? i think yes, he will get in. should he? meh. the hall of fame discussion is so tired and overblown these days i can’t seem to care who makes it or not (other than the goose). will i think of jim thome with reverence someday? no. will i show my kids videos of him and stats and such? no, because he doesn’t play futbol. is it offensive to me that he makes the hall of fame? eh. and for that matter, everyone assumes all the big sluggers from the 90s and 00s are tainted. what about thome? why did he get a free pass? because he’s white, he wears his socks high, and he plays for teams form the midwest? are you telling me he was sitting in a locker room with belle and manny, quietly eating his prayers and saying his vitamins? It ain’t cheating if you don’t get caught. and if you’re white. But seriously, saying someone is “just a DH” is like saying “Marino Rivera is just a closer. He doesn’t have the innings, wins, or strikeouts to be in the Hall of Fame.” At the end of the day, 600 home runs still means something (unless you cheated to get there), as prior to the past decade, only three people have ever reached that mark. If Thome is clean (and I have no reason to believe that he isn’t), he absolutely belongs in the Hall.